You've seen them at recode's Code Conference, on Twit.tv, on iTunes, on Facebook, on Twitter, on books, and beyond! 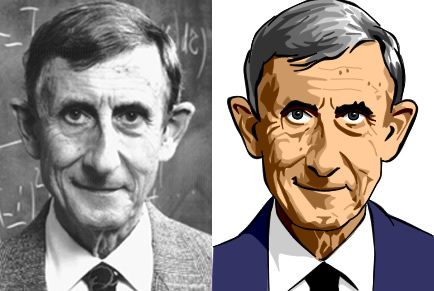 Now you too can join the ranks of famous geeks who have been drawn or painted by the venerable Nitrozac! Often imitated but never matched, her work brings out the best in people and really captures the spirit of the subject. 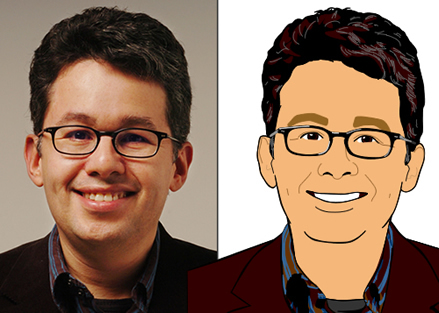 They are more natural and flattering than a caricature, but they still have a fun and timeless quality that people really love. What a great gift for you, your friend, co-workers, or even your boss! What an awesome addition to your computer desktop, website, home, office, or cubicle! perfect for your Facebook or other social networking picture! Full color digital illustration, 72 dpi, created from the photo you provide. Size is usually around 500 x 600 pixels (6 x 8 inches). If you order a 300 dpi version, it is of course, 300 dpi, and approximately 8 x 10 inches, ready for your printing. 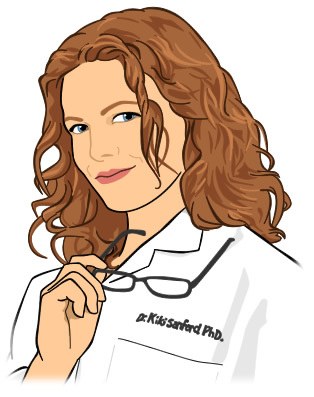 With all portraits, we also provide several smaller sizes of the portrait so that you can use it as an avatar on Facebook or Twitter, or anywhere else you would like. There are no shipping charges for a digital portrait. 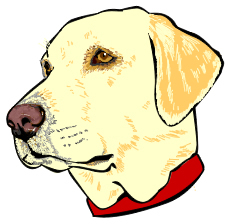 Once finished, we will email you the finished portraits, or provide a download link if it's a print file. NEW! 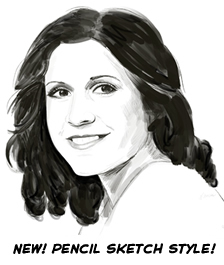 Nitrozac is now offering another style of portrait, a classic pencil sketch, in black and white, digitally created, for only $55.00! And you still get the several sizes, so you can use them everywhere! Digital Portrait by Nitrozac, in several sizes! Did you want a 300 dpi image file for printing? Yes, make a 300 dpi file for printing! Please include the URL of the photo, or else attach it to an email and send here. We will contact you shortly to discuss the details of your portrait. 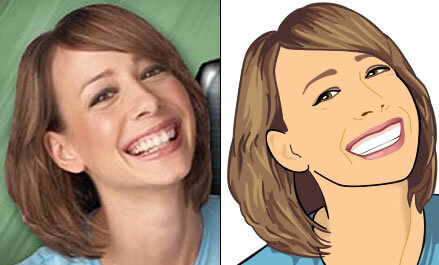 For more examples of Nitrozac's portrait work, be sure to check out TWiT.tv, and also the fine folks at Prolecto.com. Illustrations are intended for personal websites, blogs, podcasts, and similar use only, and are not to be re-published, resold, or repackaged in any other form. If you do wish to use our services for commercial reproduction, such as on t-shirts, commercial products, best selling albums and books, etc., please e-mail for other rates. Get a custom Nitrozac mini-painting! 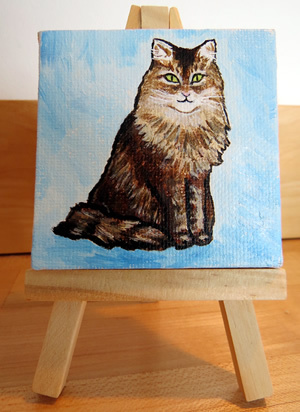 Nitrozac is now creating adorable little mini-paintings, of your pet, or scene, or of your favorite person! 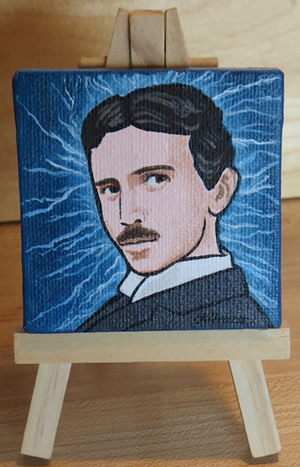 Hand painted on a 2"x 2" canvas, and includes the tiny wood easel to display it on! Makes a great addition to your office or home, and the most perfect gift ever! (If you'd like a larger version, contact us for a quote, thanks!) Note: shipping is a little bit more expensive on this item, as it includes tracking and insurance. Julio Ojeda-Zapata.from Your Tech Blog! Cali Lewis from the fabulous GeekBrief.tv!